For high-impact curb appeal and long-term performance, there’s no better choice than traditional cedar shake roofing systems. Every Minnesota homeowner knows that they need to choose a roof that is strong, efficient, and built for the local climate, but that doesn’t mean that you have to sacrifice on unique beauty and curb appeal! With cedar shake roofing from NMC Exteriors, you get the impressive beauty of natural wood roofing with all of the benefits that you are searching for. 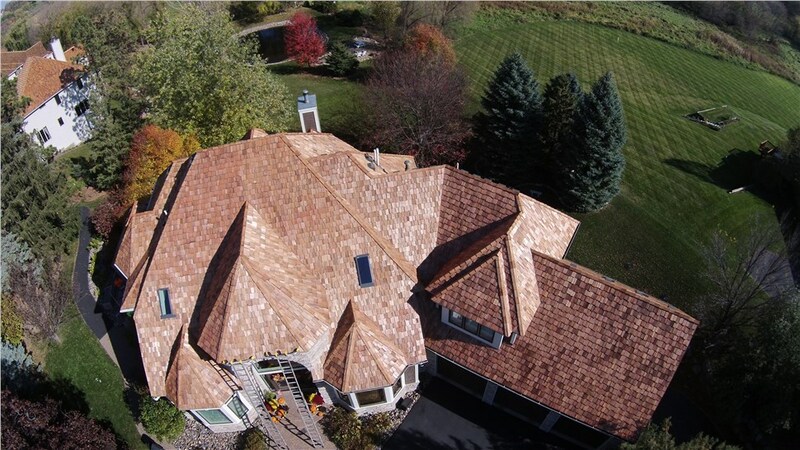 Our Minneapolis roofing company offers professional service and top-rated cedar shake systems at an affordable price, and we can ensure that your new roof makes a lasting impact on the value of your home for years down the road. Not all roofing companies have the experience needed to handle the installation of a cedar shake roof. With the specialized materials and installation techniques needed for a Minneapolis cedar shake roofing project, you need a contractor who has the industry know-how and certifications that prove their capabilities for completing the work to high standards of quality. At NMC Roofing, we’ve been offering top rated roofing services since 1999, and our roofing contractors have completed more than 10,000 projects in the Land of 10,000 Lakes. Through each stage of your project, we’ll provide superior service, personalized care, and attention to detail that guarantees that your cedar shake roof will hold up to years of wear and tear. As the only roofing material that can be maintained to prolong its service life, cedar shake roofing lasts for decades longer than some other roofing materials. You’ll get the highest R-value with cedar shakes, giving your home superior efficiency that is more than 4x the efficiency of typical shingles. Compared to other natural roofing materials, cedar shake roofing is remarkably affordable and offers timeless beauty and curb appeal. The weather in Minnesota can be extreme, but cedar shake roofs are designed to deliver impressive wind and hail resistance—protecting your local home from the elements. If you are considering a cedar shake roof for your Minneapolis residential remodel, then NMC Exteriors can help you get the most out of your investment! Learn about our premier roofing products and affordable services today by calling to speak to a member of our certified roofing team. You can also fill out our online form now to request an appointment for an in-home quote and consultation.